It's election day here in the USA, and for the occasion I thought I'd share this curious passage from an article in The New York Press, July 8, 1914, regarding Houdini's apparent inability to vote in the Presidential elections. "He's a very shrewd man--Roosevelt," said Houdini, in recalling the incident [aboard the Imperator]. "He was much shrewder than I suspected he would be. He examined the slates very carefully before he permitted them to be bound together. I wish I had a vote in this country. I admire Roosevelt tremendously. He is so representative an American citizen." Houdini was born in this country in 1874 in Appleton, Wisconsin. But he travels so much that he loses his voting privilege. Of course, what this reporter didn't know was that Houdini wasn't born in the United States. He was born in Hungary and had naturalized himself via a passport application during his first tour of Europe. So perhaps this was the real reason Houdini couldn't or didn't want to risk voting. Certainly I've never heard of extended travel taking away one's voting privilege. But I don't know how things worked back then. Recall that women couldn't even vote when this was written. But Houdini appears to have sorted out his voting issues by 1920 when he did cast a vote for Warren G. Harding for President. 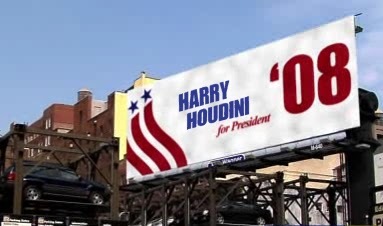 Of course, Houdini himself ran for President in 2008 (evidence below)! As far I know, he's not on the ballot this year. Wish he was. I had never thought about the issue. Was he an American citizen? If he was a naturalized citizen, couldn't he vote? Well, I guess it depends on how "official" his naturalization was. I think he just changed his birthplace on his passport app while in Europe and, bingo, American. But later in life -- maybe when he was selling war bonds during WWI -- he might have gone through an official process. That's why he could vote in the 1920 election. God, if he had, the birthers would have had a field day.